GRANBY – Granby Elementary School has been praised by the local arm of the American Heart Association for being a fundraising partner for the last 40 years. 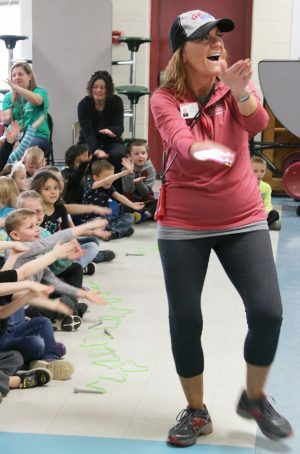 Meg Corey, American Heart Association youth market director, leads Granby Elementary School students in the “Baby Shark” song, as a nod to one component of the AHA’s Jump Rope for Heart fundraising effort. Granby kindergartners excitedly participate with Corey. Since the AHA’s Jump Rope for Heart program began four decades ago, Granby Elementary has raised thousands of dollars to help doctors and scientists figure out additional ways to fix hearts of children and adults. Meg Corey, local AHA youth market director, recently visited Granby for the school’s kick-off celebration, where she helped physical education teacher Kelsey Maselli announce that each student would have a small fundraising goal of $5. “I also want your hearts so strong and healthy that you never have to worry about using money raised,” Corey said. When students return from spring break, they will participate in Jump Rope for Heart during their physical education classes. Prizes will be awarded by the AHA for various fundraising levels achieved. Corey said one of the more popular prizes is the coveted “Baby Shark”-inspired character, Finn, named after a childhood heart survivor. Each Granby student also walked away with a glow-in-the-dark bracelet to wear as a reminder to remain heart healthy.